I am always ready for a weekend trip, but it has to be close and easy with a super active four-year-old in tow. Slovenia was just that! We had wanted see Slovenia since it was within driving distance from Budapest (our last home) and spring was starting. We were able to get a nice taste of the capital city Ljubljana, the sea and an alpine lake all in just a couple days. The short connecting flights from Warsaw were not great — it meant carry-on baggage, lots of stairs and buses, and a security checkpoint in between — but Miss H was a great traveler and at least there is no stroller now to tend with! Day 1: Walking, some time to play and the sun. Ljubljana itself is very compact and there are a lot of pedestrian only streets throughout the pretty historic center which makes it great for walking with young children. Footbridges connect the two sides of the riverfront, which was packed with nice-looking cafes and restaurants. On our first day, we went to a Cafe Colnarna in the Tivoli Gardens. We sat outside for lunch and watched Miss H’s excitement over the much-needed sun and green grass, a climb on the playground and the opportunity to pick a few flowers. Then we took a look at the river flowing nearby. Day 2: Day trip to Lake Bled AND the Sea. The original plan was to spend the day at Lake Bled, but the weather was rainy and cool. We went ahead with plans for a short 45 minute drive out to Lake Bled. Due to weather, we only took a walk (or in Miss H’s case, a run) around the lake. You can also rent a boat to take a short trip out to the island in the center of the lake and take a trek up to the castle. During the walk, we decided to make the 1.5 hour drive out to Piran, on the Adriatic Sea between Croatia and Italy. It was really was a mix between a low-key Venice without all the masses of tourists and a town in Croatia on the sea. Miss H was very excited on the change of plans. Unfortunately for us though, she was thinking we were going to the beach in FL, which meant swimsuits and flip flops and shells. But after we had a great lunch of fresh seafood and pasta, her mood improved. We climbed on seafront rocks, collected smooth stones and explored the narrow passages of the old town. Day 3: Ljubljana castle, a museum and a playhouse. 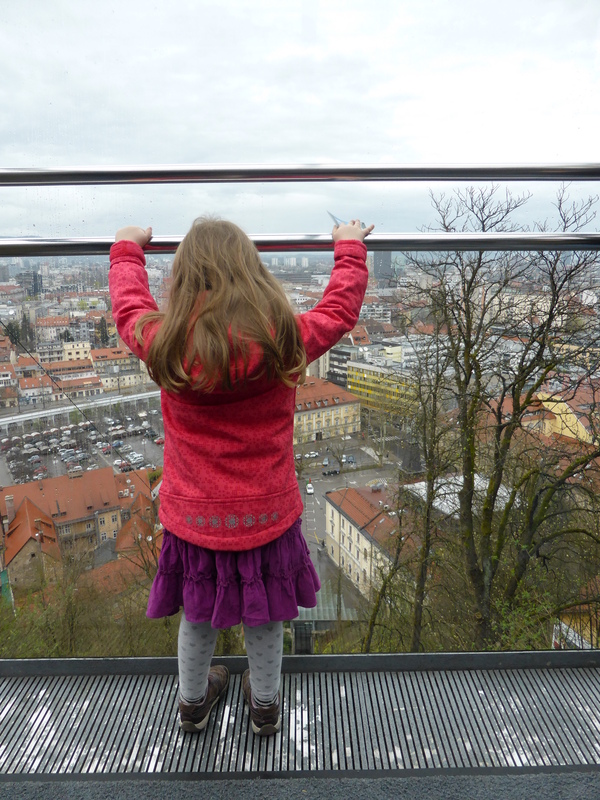 Back in Ljubljana, we took a ride on the funicular up to the castle. This was well worth the effort even in the mist. The view from the funicular and the castle were both excellent, and Miss H loved the funicular ride. After the castle and some lunch, it was still raining so we decided to head to the Natural History Museum. It is a small museum but we were very lucky to find a temporary exhibit of traditional puppets! There were also a few interactive screens and games for children. In the afternoon, we decided to check out, Mala Ulica, an indoor cafe and play center for some free time. It was really cute, geared for pre-school age with areas to climb, explore and play house. We can’t wait to go back to Slovenia. And, the best thing about the trip– Adria Airways just started direct flights from Warsaw to Ljubljana! Hi Jennifer, really enjoyed the post! We’ve been to Slovenia a couple of times and will definitely return, we’ve just spent long weekends there before http://bit.ly/2h7p4mO and hadn’t considered the coast before, but definitely will now! Thanks for info!